Why Hot Chocolate Might Be More American Than Apple Pie : The Salt George Washington drank hot chocolate for breakfast, according to historians. But his version was flavored with chili powder, vanilla and allspice, and contained less sugar than the cocoa of today. 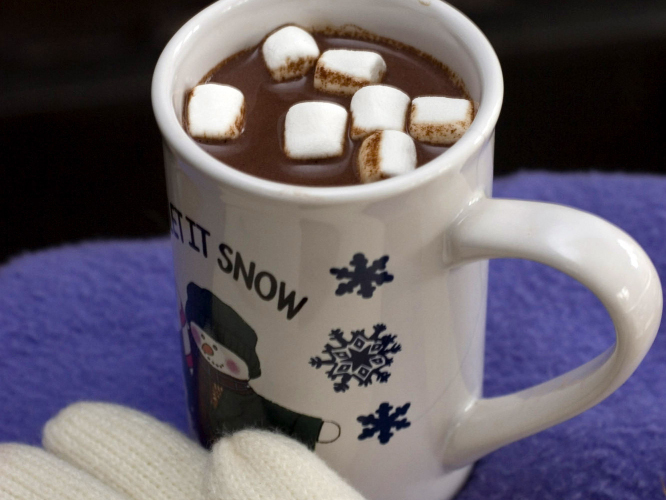 George Washington would probably approve of hot chocolate on a cold winter's day. In this frigid month of February, it may be comforting to know that hot chocolate might just be more American than apple pie. George Washington might make that case if he was still around. When he dug into his favorite breakfast of cornmeal hoe cakes with honey and butter, he often washed them down with warm chocolate cream, according to Dining with the Washingtons, a cookbook published in 2011 by the staff at George Washington's Mount Vernon Estate. The book offers updated versions of typical recipes from the period and a glimpse into the first president's favorite foods. Rodney Snyder, a chocolate historian at Mars Inc. who spoke at a chocolate-making demonstration at the National Archives this month, has also found ample evidence of hot chocolate's place in early American history. For most of its history, chocolate was a drink. Candies and solid bars didn't catch on until the late 1800s, Snyder says. According to Mary Thompson, a research historian at Mount Vernon, chocolate was one of many unfamiliar ingredients the colonial settlers encountered when they arrived in the Americas. At first, they were most likely to embrace foods that reminded them of Europe. But chocolate was an exception: It was novel and immediately appealing, says Thompson. 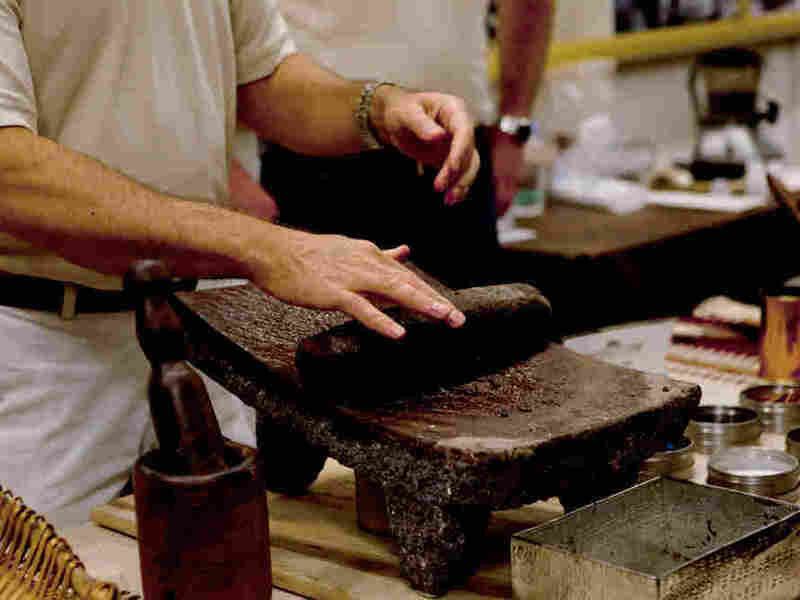 A Mars Inc. employee demonstrates how cacao beans are ground into cocoa powder at a chocolate-making demonstration at the National Archives. In 18th century Europe, chocolate was a status symbol — a treat for the rich and the royals. But Snyder says in North America it was enjoyed by president and commoner alike. That difference stems from the cacao's point of origin, in the Americas, and the relative cheapness of Caribbean sugar. In colonial America, chocolate wasn't relegated to the breakfast nook, either. It was instead valued as a high-energy food that didn't spoil, a precursor to today's athletes drinking chocolate milk to recover after a workout. "Chocolate is very transportable, so it was very good for the army," Snyder says. So when Washington filled his canteen with cherry bounce (his favorite mixture of juice, spices and brandy) and headed out for the frontier, he may have packed some chocolate then, as well. If hot chocolate for breakfast isn't your cup of tea, try the cake recipe featured in the cookbook, which Washington and pals are said to have dunked into their hot chocolate on occasion, too. A version of this story was first published on Dec. 5, 2011.